snowdeal.org > ex machina: sadly, despite the best efforts of the progressive farming movement, the round barn never really caught on. sadly, despite the best efforts of the progressive farming movement, the round barn never really caught on. from 1880-1920 progressive agricultural colleges attempted to popularize round barns on the basis that they had a greater volume-to-surface ratio than a square shaped barn and were therefore cheaper to construct. but standardization of the construction industry and mechanization of american agriculture ( i.e. it's easier to park you shiny, new combine in a square barn ) quickly minimized any efficiencies gained. 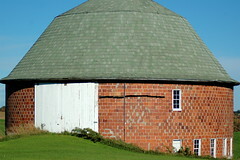 although no new round barns have been built in the area for nearly 80 years, vernon county, wisconsin has more of standing round barns than any other county in the united states.